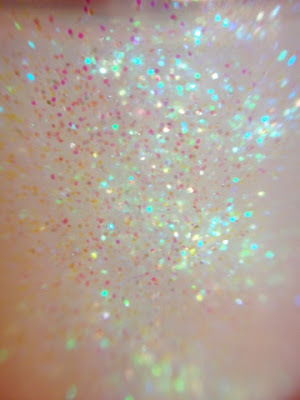 I have some absolutely gorgeous glitters to review. First lets talk about their indie creationist. Polished by KPT is run by Katherine and she is a glitter machine! She's not only limited to glitters she does awesome colors as well. I got October Babies and Bleu Tonic. 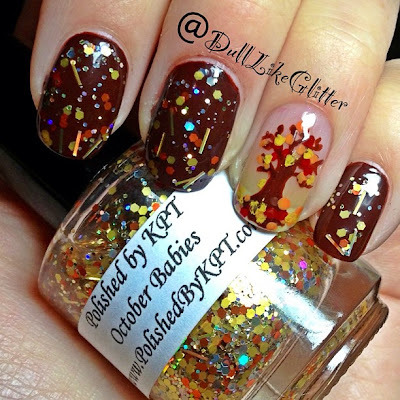 October Babies is the perfect Autumnal glitter for your fingertips. 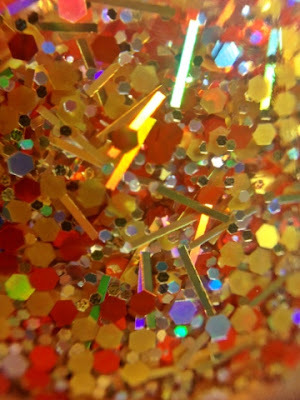 Just check out this macro of all these glitters swimming in this polish. I used Revlon Universe as the brown undercoat and spread October Babies over as a glitter top coat. The formula went on smoothly and the glitter dispersed evenly. I splashed a little nail art on there with it of course. Here is the completed look. This polish is currently ON SALE on her site for $6. 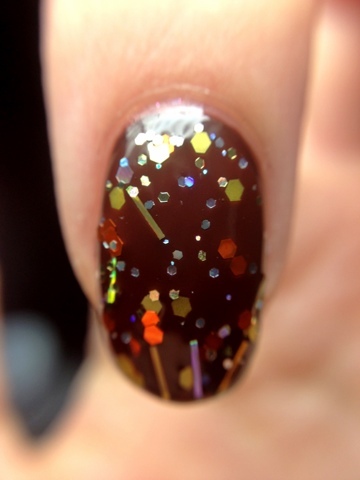 Super affordable especially for an indie polish that is limited edition! You can find it here. Get it before it's gone! Next up is Bleu Tonic. Not only is this polish blue but it's violet, pink, green and even slightly yellow! The glitters are color shifting so you never know what you're going to get. Just check out this macro to see what I mean. 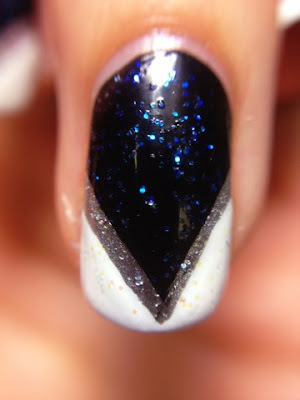 For this mani I wanted to show the difference of this glitter over different colors so I did a black, silver and white chevron mani using China Glaze Liquid Leather, Essie No Place Like Chrome and Essie Blanc. I love how the blue and green really shows up against the black but the yellow and pink come through on the white. 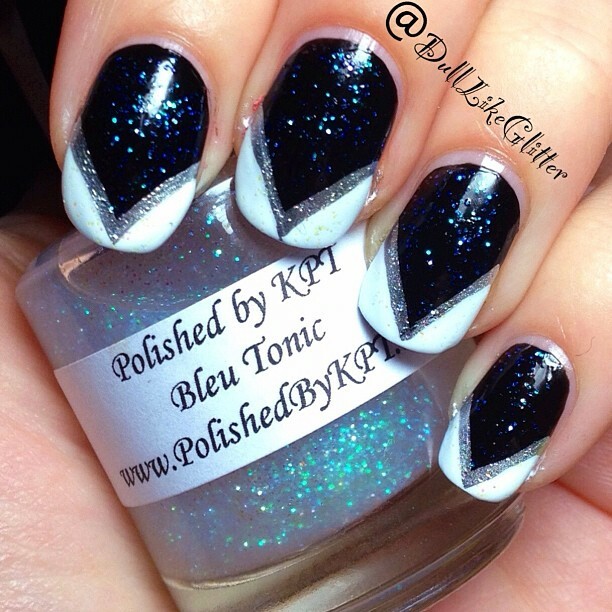 Bleu Tonic is currently available on sale for $10 from her store and you can find it here. This polish was gorgeous and easy to apply. It has the perfect icy winter effect for all your cold weather manis! What I love about the Polished by KPT polishes is all the love put into these polishes! Polished by KPT is 3 free and cruelty free. Each bottle is hand mixed and made! I love supporting indie brands so make sure to stop by her shop and check out all her amazing polishes.